Honda Activa is a trusted brand in the Indian vehicle industry. The Honda Activa series debuted in 2000. Since then, it has lived up to the expectations of people by giving four generations of Honda Activa. Now, Honda Activa 5G is making the buzz. So, does it top the table with its updates? Let’s find out. Honda Activa 5G has two variations: standard & deluxe. This is an addition as its predecessor didn’t have any variants. The price of the standard variant is 52,460 while the deluxe scooter is 54,325. The only difference between the two is that the deluxe scooter has an instrument console which is semi-digital. LED lamps with DRL are placed instead of normal light. The scooter looks more stylish and up-market. LED lights are very powerful. They also increase the visibility power. This feature is the first one to come in a 110cc scooter. The next update is a 4-in-1 lock mechanism. By this mechanism, the seat can be opened or closed conveniently. There is space to open and close the lock of keyhole making it safer. But, there is just one thing missing in this mechanism. There isn’t any fuel filler cap in the external body. As already mentioned, the price of the DLX version is high because of the semi-digital instrument console. This is an eco-speed indicator and gives you a reminder as to when the servicing is required. This feature is like bliss for all those people who forget about servicing due to their lethargy. 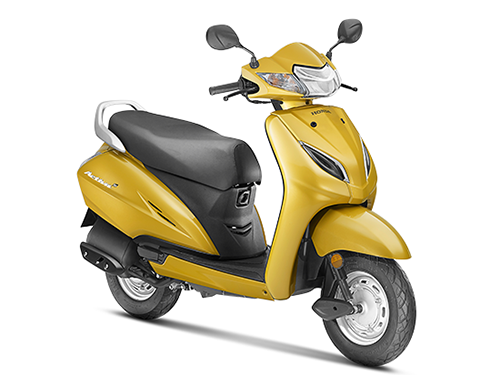 Although the looks are almost the same as Activa 4G, some subtle changes have been done to enhance the scooter’s appearance. Some new colors have also been added to make it look more attractive. Chrome inserts are there in the front apron of the scooter. The newest color additions are dazzle yellow metallic and pearl spartan red. Both these colors are rich and stand out from others. They look stunning and enhance the scooter. The engine, design, underpinnings, combi-brake system are more or less the same. Just like its predecessor, Activa 5G has wide seats for both rider and person sitting behind for a comfy ride. It has body balancing and with combi-brakes, this vehicle becomes safer. But that doesn’t make Activa 5G the same as 4G. It stands out from its predecessors because of the new updates which have been done. These new updates definitely make Honda Activa 5G the new generation scooter. The scooter has been flaunted in the right direction to grab the attention of Honda Activa lovers. Since its launch, this scooter has become the best seller. Honda Activa 5G is a trusted scooter and is reliable. It has a longer life and does not require too much maintenance. With its amazing updates, this scooter is topping the charts of best sellers. The standards of Honda Activa series have reached a peak and Honda Activa 5G has taken it to a different level altogether with its great performance and credibility. So, if you want a scooter which is peppy enough for you, then go in for the latest Honda Activa 5G.